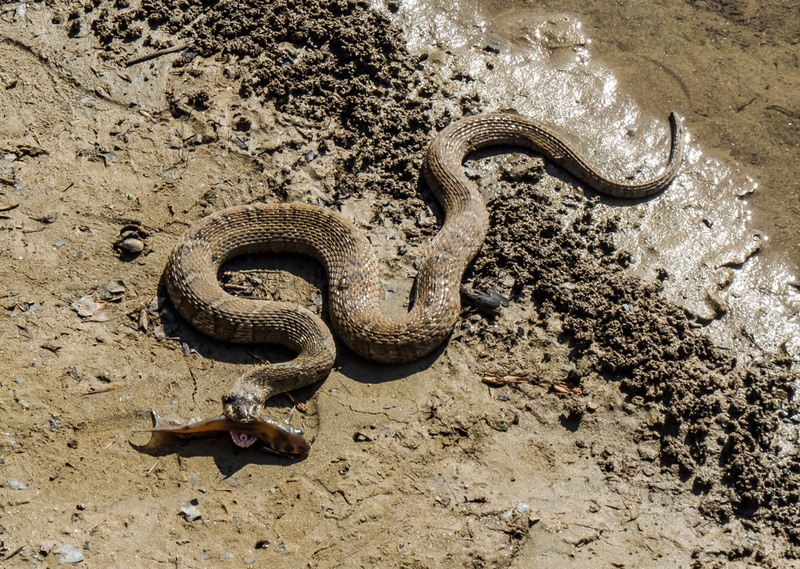 Anyone who has ever gone fishing has a story of “the one that got away.” This Northern Water Snake (Nerodia sipedon) wanted to make sure that it did not have such a story to tell and dragged its prey onto dry land. Then the snake faced the challenge of figuring out how to swallow the large fish. 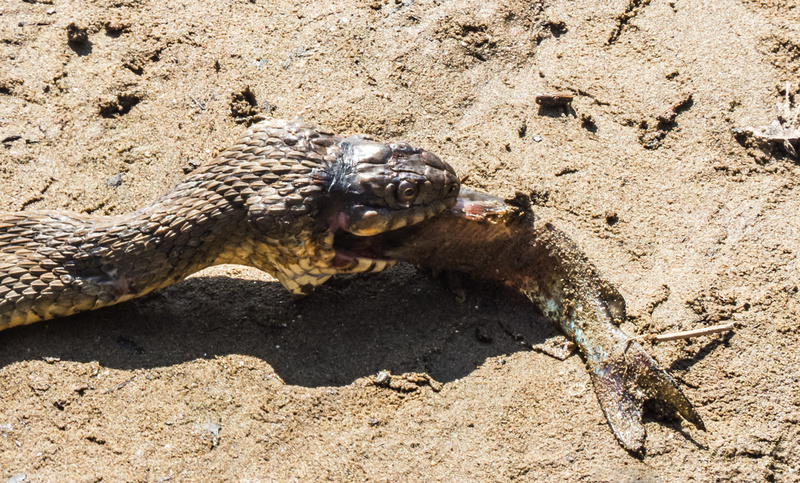 The snake twisted and turned and contorted its body and head as it gradually ingested the fish. 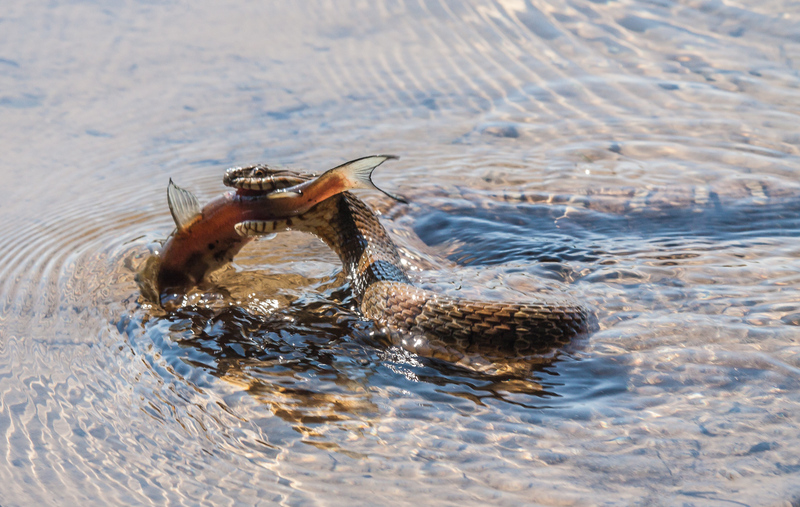 When the fish was part way down its throat, the snake appeared to push up against a log for additional leverage. I captured a sequence of shots that speak for themselves, so I will not bother to explain each of them. Like me, you will probably feel a kind of macabre mixture of horror and fascination as you view them. I spent much of my time Friday at Occoquan Bay National Wildlife Refuge scanning the trees for birds. 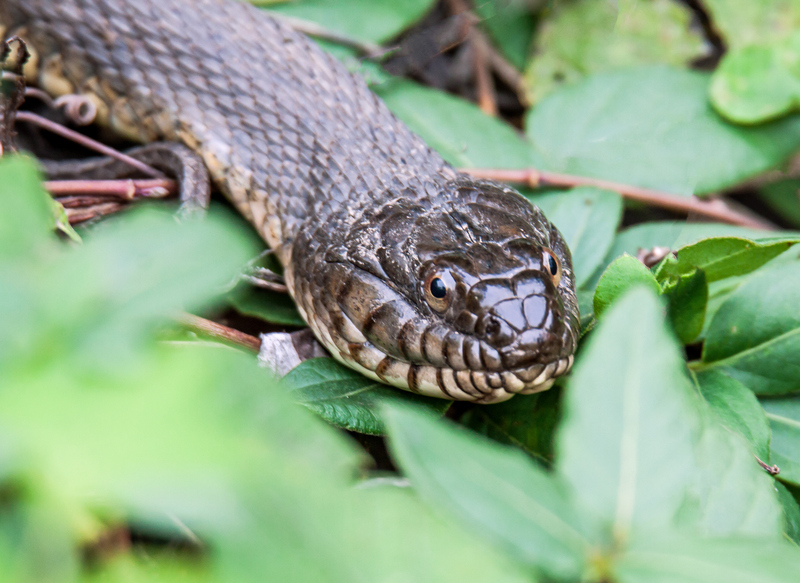 On one of the rare moments when I was looking down, I ended up looking into the eyes of what appears to be a Northern Watersnake (Nerodia sipedon). 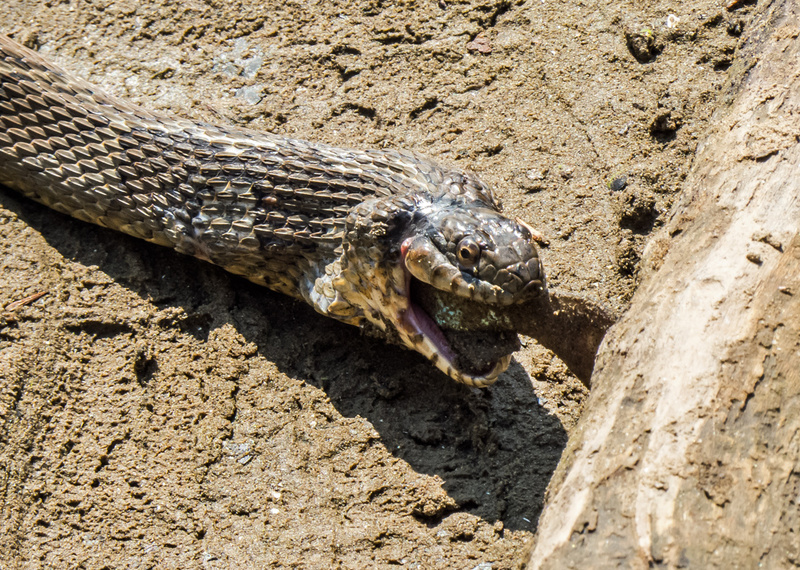 Although it may look like I was dangerously close to this snake, I took these shots with my Tamron 150-600mm lens, which has a minimum focusing distance of almost 9 feet (274 cm). 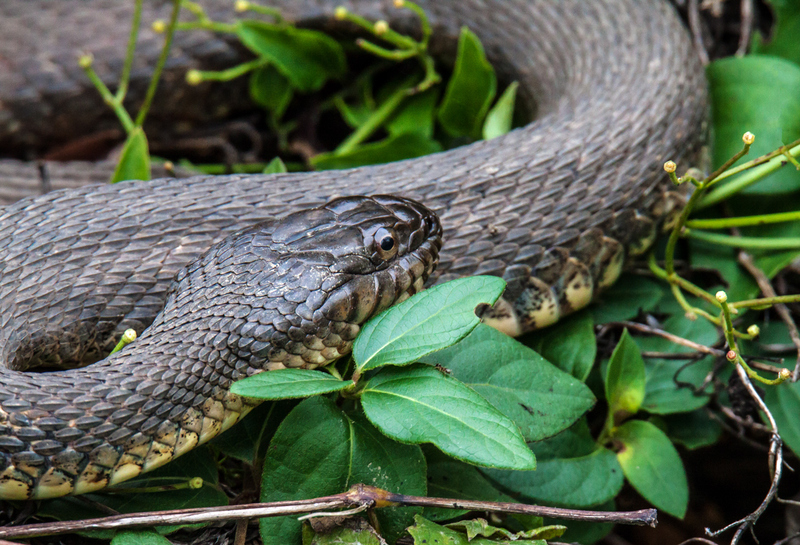 Northern Watersnakes are not poisonous, but I have been told that their bites can be very painful and that the snakes inject an anti-coagulant when they bite, so wounds tend to bleed profusely. I particularly like the way that I was able to capture some of the details of the snake, including its scales and its head. If you look closely, you can even see a miniature landscape in the eyes of the snake. 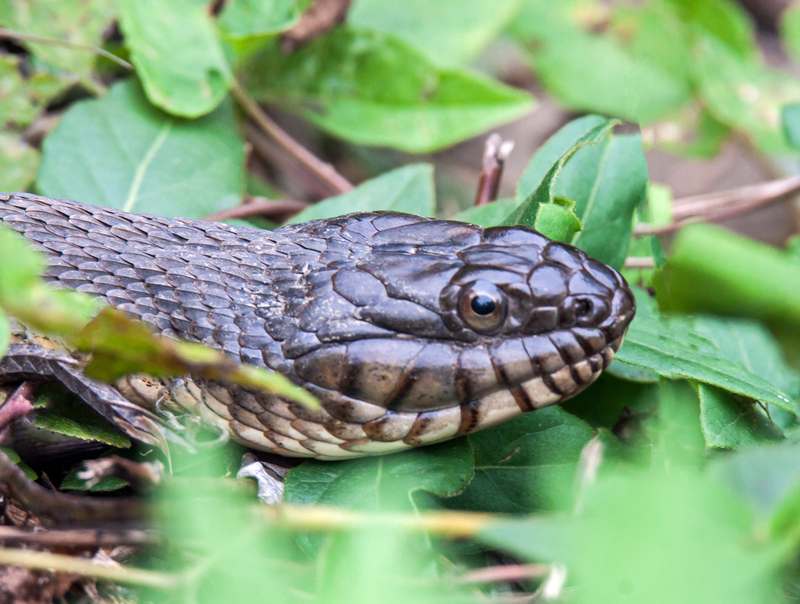 UPDATE: One of the viewers on my Facebook page commented that this looks more like an Eastern Ratsnake (Pantherophis alleghaniensis) than a Northern Watersnake. I am hoping to get some clarification on the species of this snake and would welcome the views of any readers with expertise in this area. 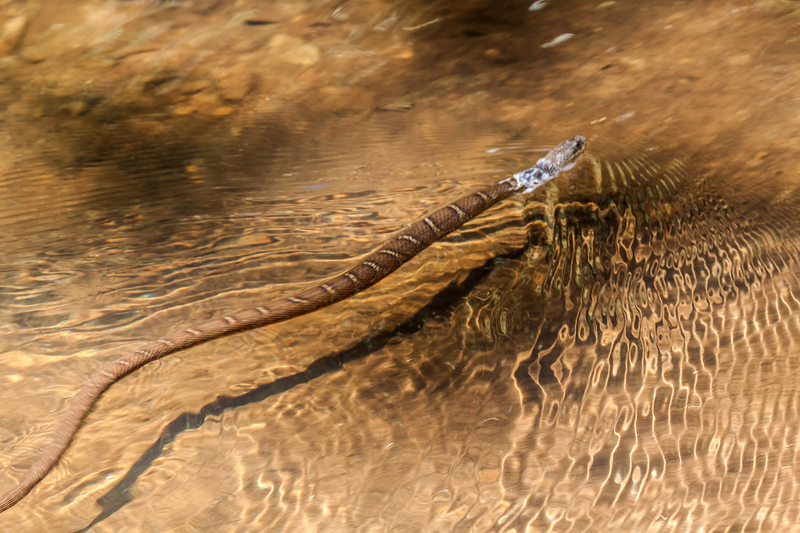 It may appear to be the Loch Ness monster, but I am pretty sure that it is “only” a Northern Water Snake (Nerodia sipedon). I stumbled upon it yesterday while exploring Riverbend Park in Great Falls, Virginia just after it had caught a pretty good-sized catfish. 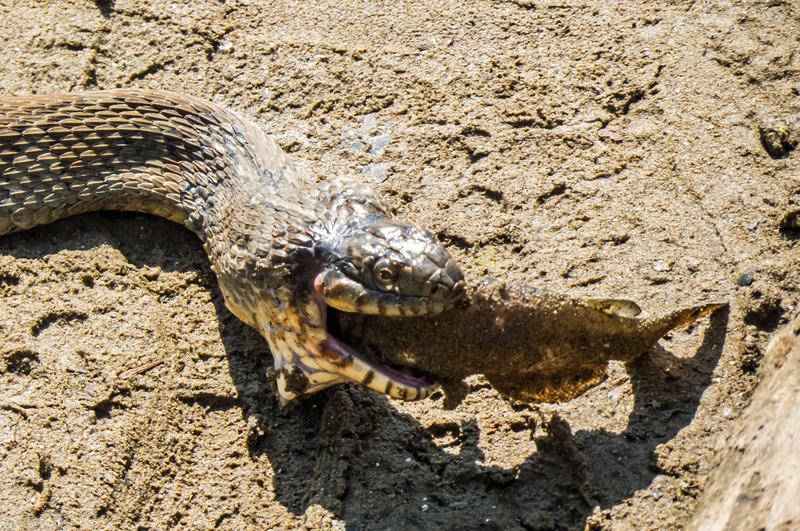 It took a while to subdue the fish, but the snake eventually was able to swallow it. 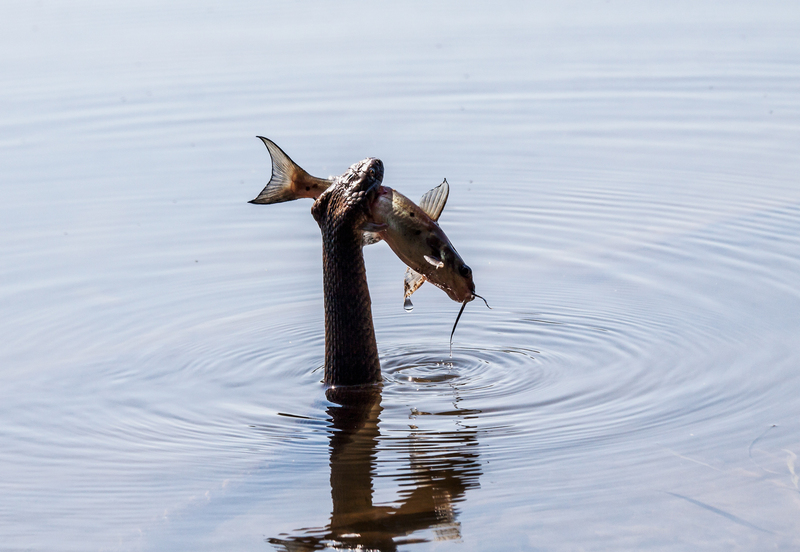 I have seen snakes like this catch small fish before, but I was shocked to see the size of its catch this time. 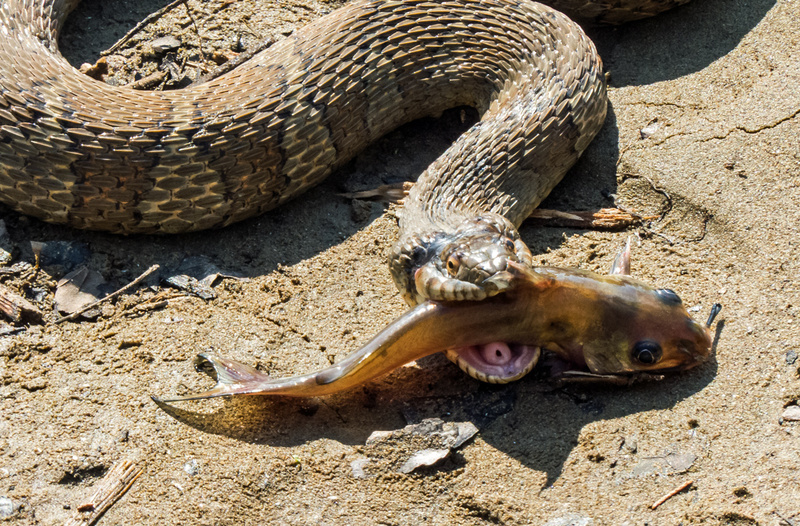 How does a snake subdue and immobilize a fish that big? 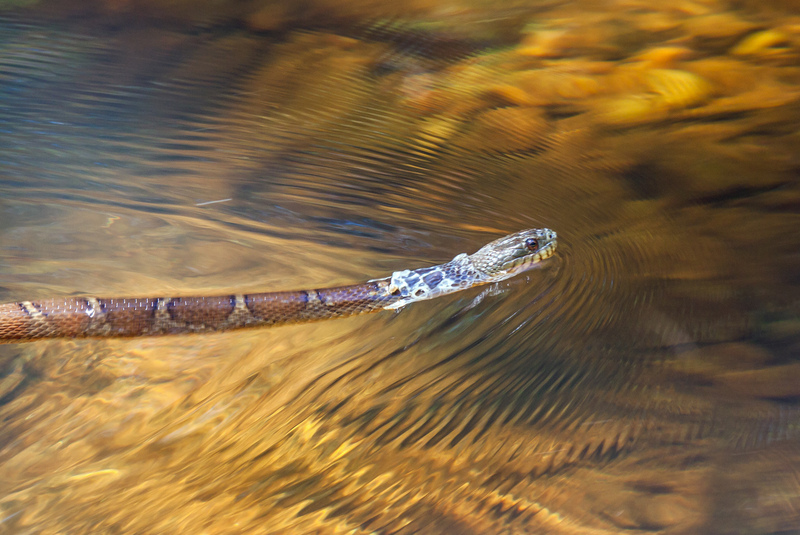 Northern Water Snakes are not poisonous, though I have been told that their bite can be quite painful and that the snake injects an anti-coagulant into your system, so that you will bleed a lot. 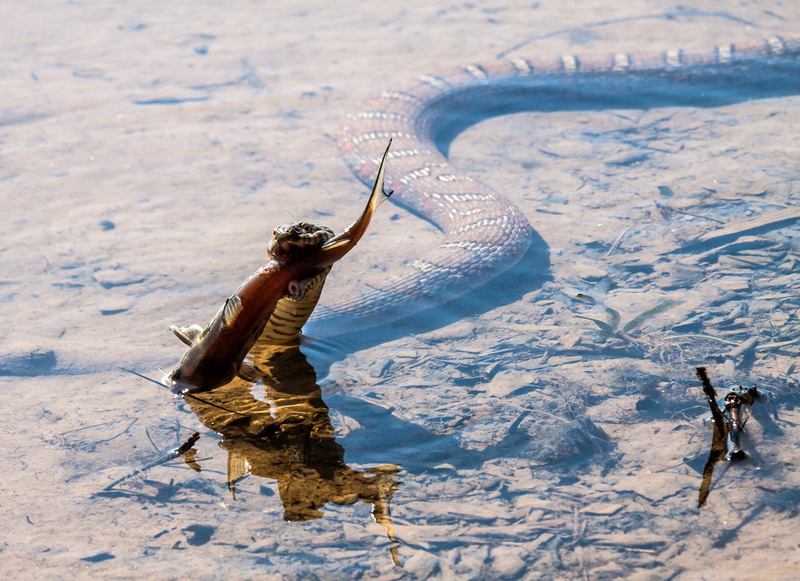 The snake swam around with the fish for quite some time, periodically rearing its head and part of its body out of the water. 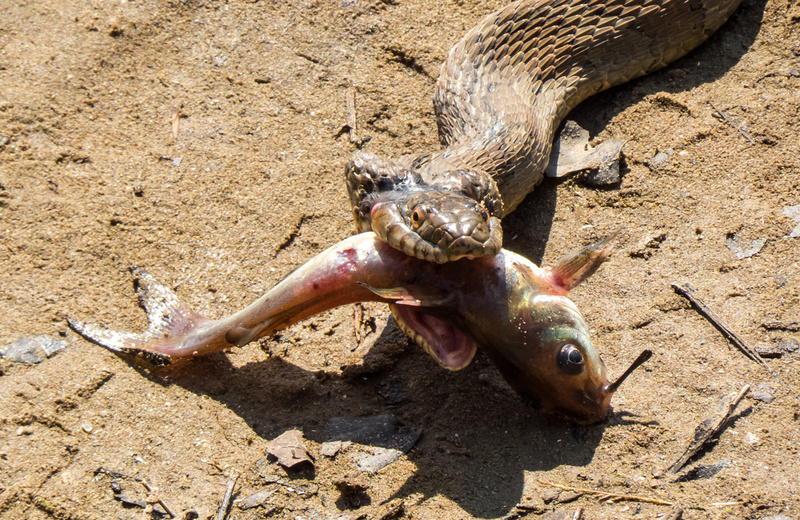 The snake’s mouth seemed to have a literal death grip on the fish. I watched the action with a mixture of horror and fascination, frozen in place to avoid spooking the snake. The snake seemed to be adjusting the position of the fish, as I had seen herons do, and I wondered how it could possibly swallow the fish. 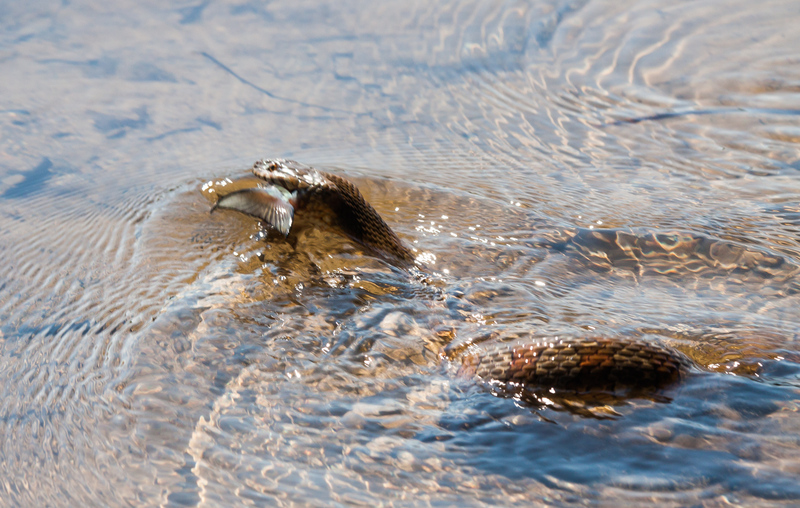 Suddenly there was a lot of movement in the water, the snake’s body started to writhe, and the fish simply disappeared, except for a small piece of the tail still sticking out of the fish’s mouth. 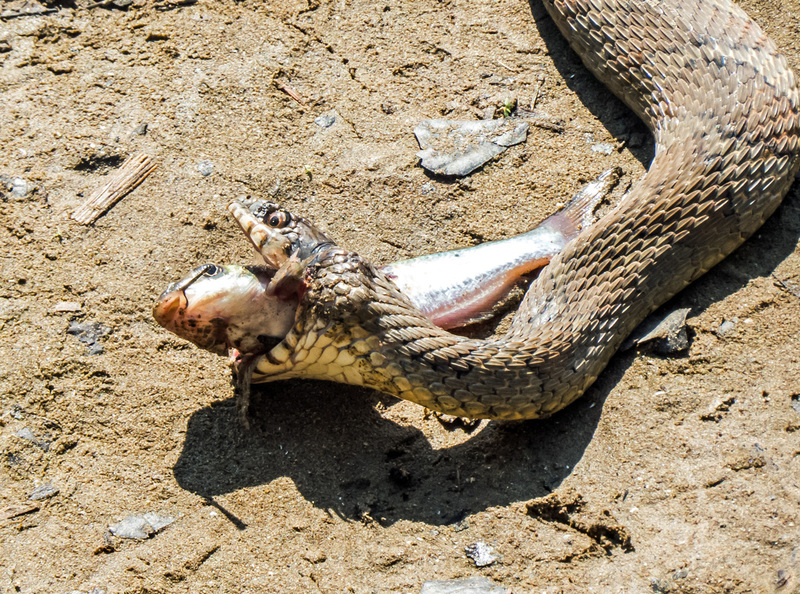 I still don’t know exactly how the snake ingested the fish—one minute it was then and then in a blink of an eye it wasn’t. 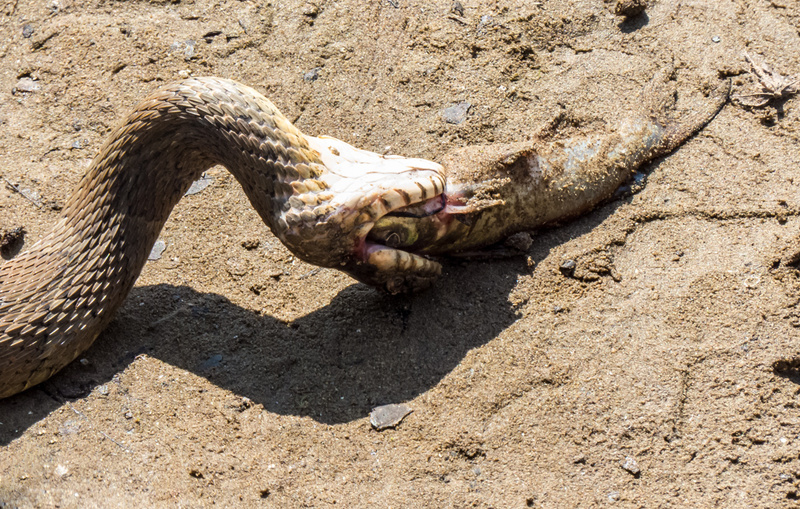 It seemed like some kind of magical legerdemain (which is probably the wrong term for a limbless creature), though I suspect that the snake has powerful muscles that enabled it to pull in the fish all at once. There are signs in Riverbend Park warning folks not to swim in the Potomac River, probably because of the current. I think that I have found another reason to stay out of the water. 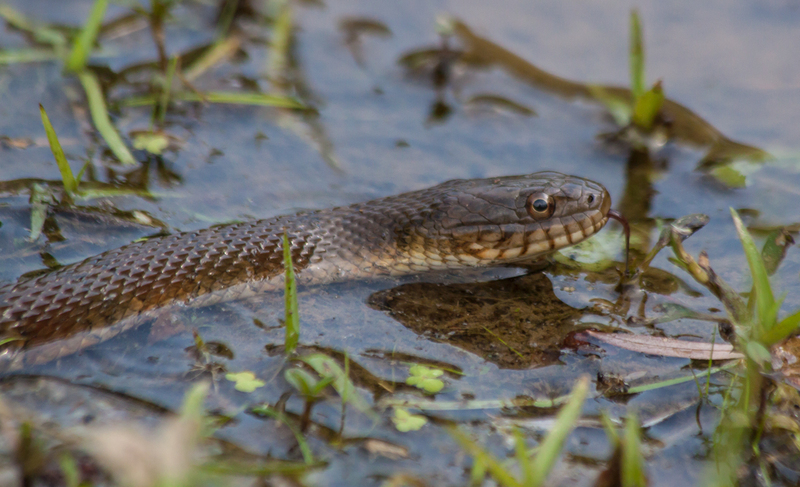 When a Northern Watersnake (Nerodia sipedon) sensed my presence at the edge of a pond this weekend at Meadowlark Botanical Gardens, it began to swim right at me. 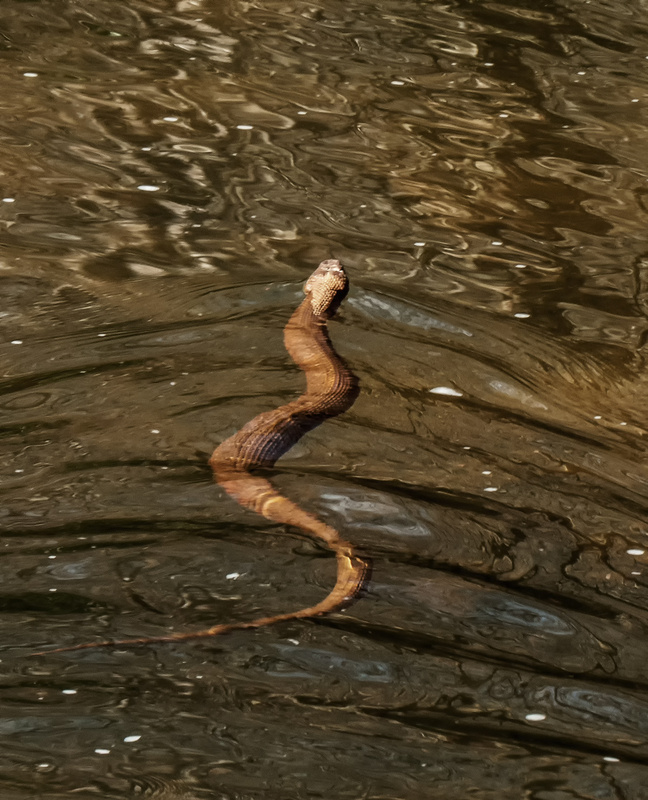 As the snake grew larger and larger in my viewfinder, I assumed it would veer off. I was wrong. The snake actually came out of the water and I captured this first shot of the triumphant snake who forced me to back away. 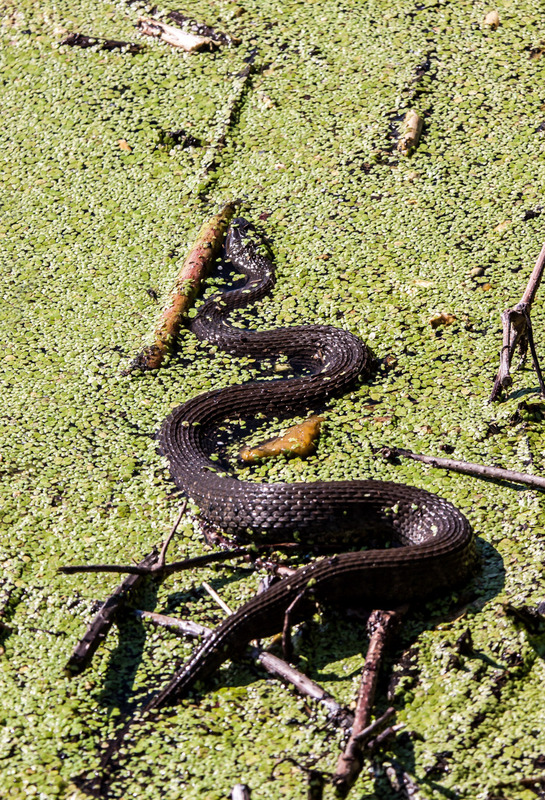 Initially the snake was swimming lazily in the shallow water of the pond, seemingly basking in the warm of the midday sun. 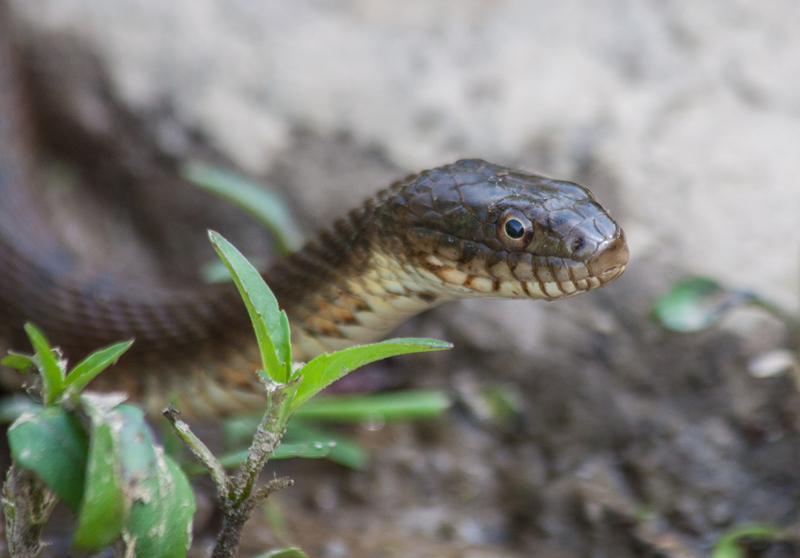 Suddenly the snake turned its head and looked straight at me. It did not look amused. 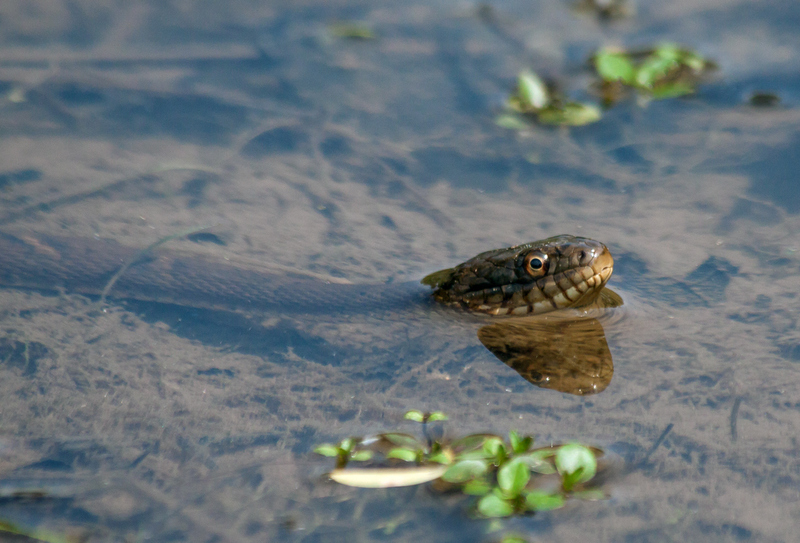 The snake started to flick its forked tongue and began to swim rapidly through the vegetation that separated us. 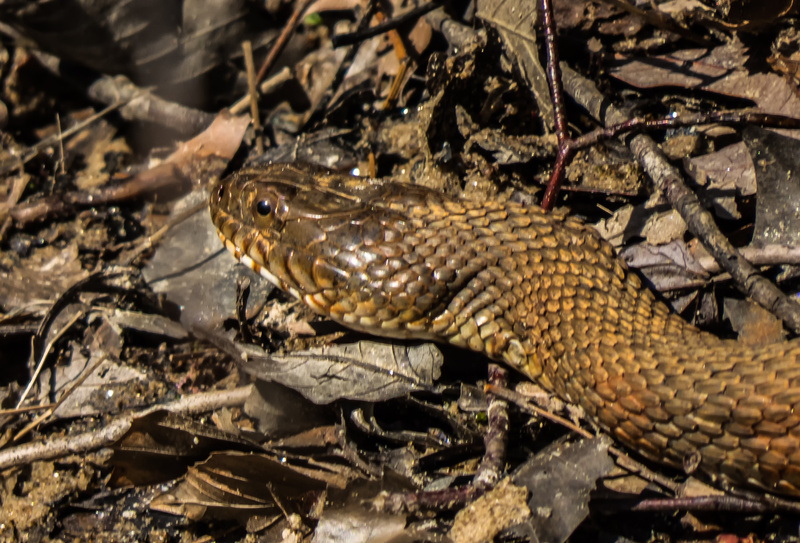 A part of my brain certainly understood that the snake was not as close as it looked in my telephoto zoom lens, but a more instinctive, primordial part of the brain kicked in when the snake started to fill the viewfinder. I know that this kind of snake is not poisonous and that I had nothing to fear, those rational thoughts were crowded out by the emotional responses that screamed at me that I needed to back away. 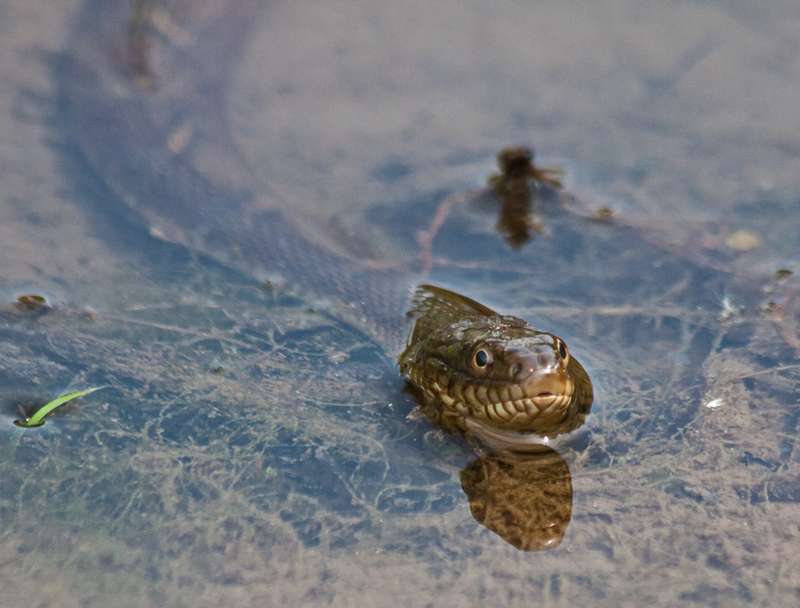 I honestly did not expect the snake to come out of the water and it happened so fast that I am not sure how it did it. 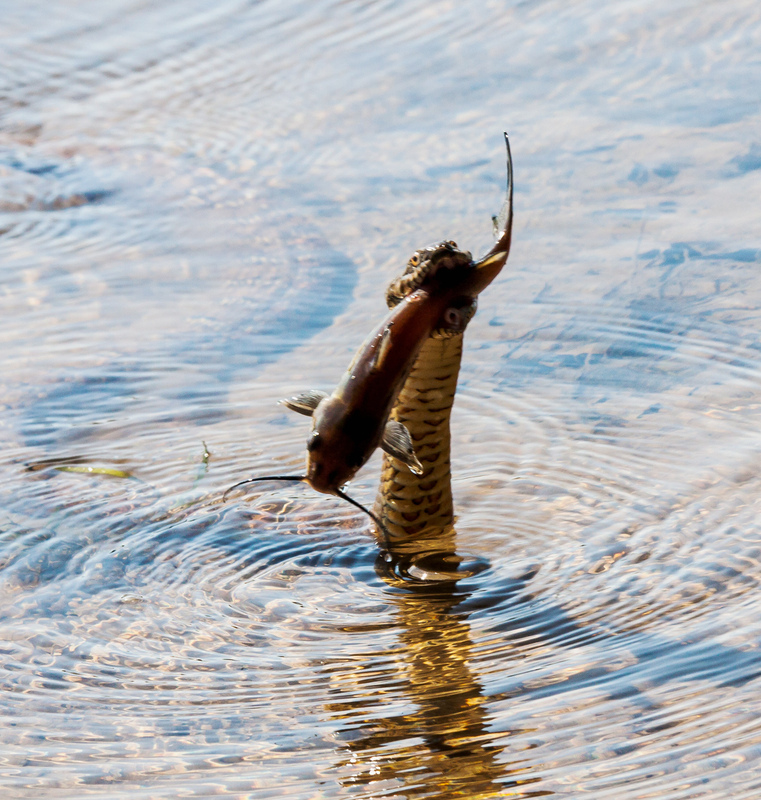 The snake seemed to propel itself out of the water in a jump. Once it was on terra firma, the snake assumed the confrontational pose that you see in the first photo. This round goes to the snake.